A wide beam of blue starlight descends from the heavens, and from within it steps the familiar sight of legendary archmage, Velkan the White. Welcome back, heroes! You have proven your valor in vanquishing those many foes lurking in dungeons deep, but the Evil Keeper is once again recruiting! Hordes of new monsters join his legions, vile beasts that clamor for your valiant blood! Velkan tosses sand into the air, where it hangs aloft like a canvas. The grains take on pigment to form a painting of horrid creatures clawing their way up from a chasm. Once more, I call upon you to act as defenders of the Light. I shall help you as best I can. I offer you these formidable weapons. They will be of great help in the battles to come. As Velkan hands the weapons over to you, the beam of starlight behind him fades away. In the dimness of night, you can barely make out his face as he advises in a harsh whisper, Be bold, heroes! And never retreat when facing the minions of the Darkness! Welcome to Of Heroes and Monsters, the first expansion for 0one's Venture©! Of Heroes and Monsters brings you exciting new additions to broaden your game. Be aware this is not a complete game, you must own Venture© in order to play with this expansion. 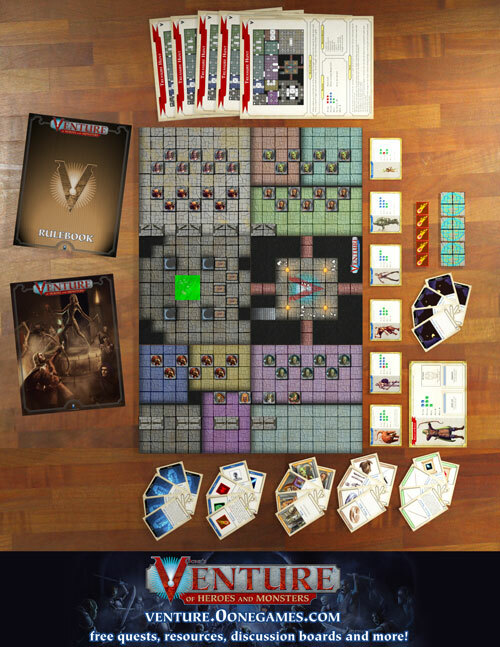 • Rulebook and Quest sheets: A richly illustrated full color rulebook with plenty of examples and images to help you understand the game. You get also eight quests to play right out of the box. The new rules include the all-new miniboss mechanic, locked chests and more. • Heroes Sheet and Monsters Sheets: Now with our new expansion we will introduce a new Hero: The Ranger. The ranger will cover mainly the role of archer, throwing rain of arrows from the back of the group, but, if properly equipped, he can even take the role of additional melee fighter. Plus you get six new monsters, three of them with special abilities: Troll, Gnoll, Goblin Archer, Mummy, Animated Armor and Rust Monsters. Read here a preview article about monsters and hero. • Evil Keeper Screen Replacements: Two replacement sheets to update your Evil Keeper Screen. • Regular Counters and Travelmate Counters: New counters for magical traps. Furthermore the Travelmate counters allows you to play the game without any paper model or miniature. • Cards: You get a set of 82 illustrated cards, for initiative, events, new equipment, spells and minibosses. Read here a preview article about events and minibosses. and here about spells and equipment. - If you buy this edition of the game expansion you will not have paper models nor miniatures, replaced by a set of counters. 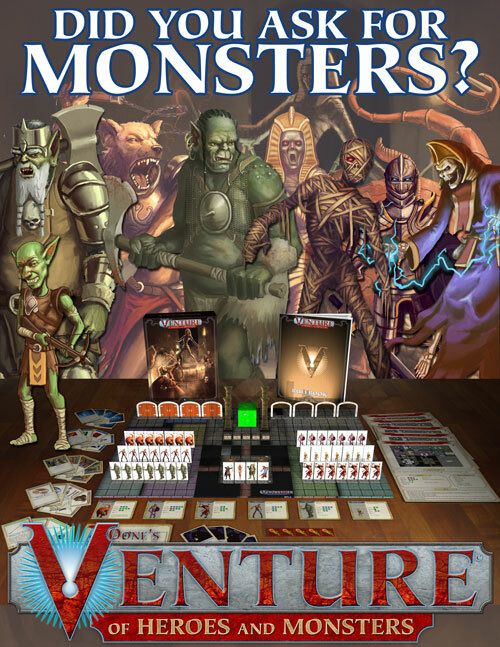 If you change your mind you can buy Venture: Of Heores and Monsters - Paper Models & Miniatures as a separate product. - This game expansion comes as a group of PDF files, you must print them and build the game before play.